What would happen if you would cross a light pink and a yellow peony? The result would be Vanilla Schnapps. Creme-coloured on the outside, soft light pink on the inside: a magical play of colours. The flowers are big in the bud and delicate in bloom. Vanilla Schnapps blossomed for the first time in 1982. Nevertheless, her breeders Seidl and Bremer decided to register her in 2013. At this moment, great numbers of this peony are available for the market. She is ready to conquer the world as a cut flower. Seidl is the founding father of many peony varieties such as Pink Vanguard and Pastelegance. A great trait of Vanilla Schnapps is her lovely smell. 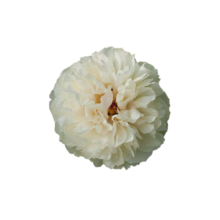 Peony fans with a preference for odorous peonies will fall in love with this flower.